Ford Motor is touting that some of its models can run on gasoline, ethanol or any mix of the two. 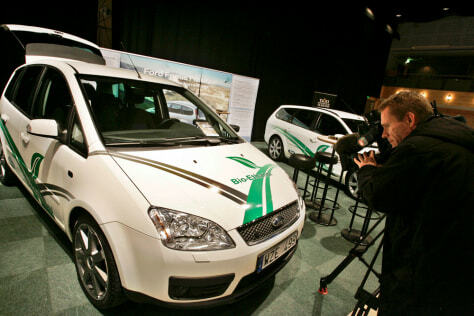 Here it displays the Ford Focus Flexi-Fuel last November at an exhibition in Stockholm, Sweden, for environmentally friendly cars. The European model is not sold in the United States, but Taurus, Crown Victoria, Grand Marquis, Town Car and F-Series models are available in "flexible fuel" versions.